I roasted turkeys for years before I learned about the two most important technical factors: brining and roasting white meat to 150F. The problem was, I used to believe my meat thermometer. It says to roast turkey to 185F, so that must be right. Right? Well, I thought so, and dozens of turkeys were subjected to my thermometer's dictate. 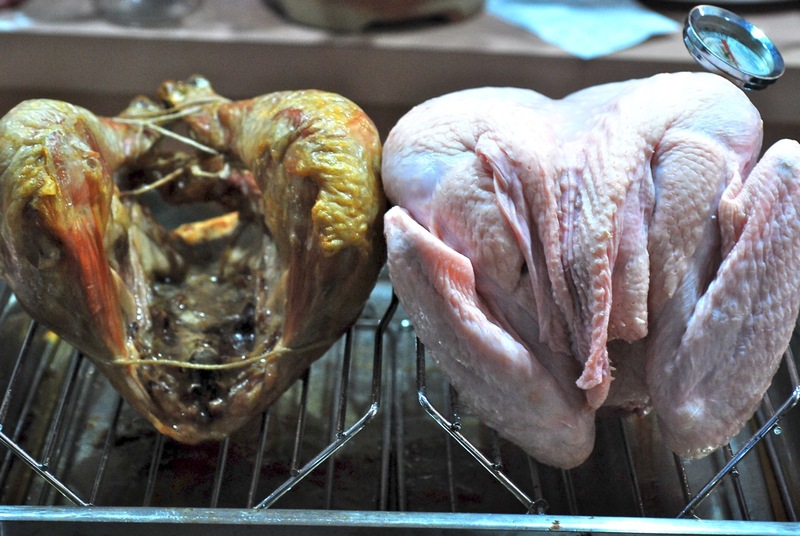 Of course, my thermometer didn't have to eat the result: dry, stringy white meat and greasy, slippery dark meat. Basically, the white meat was overdone, and the dark meat was underdone. 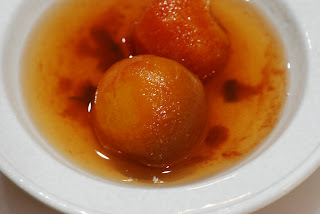 But somehow, I didn't figure this out until a couple of years ago, when I heard about Alton Brown's brining technique. I tried it, and it was a revelation. I still cooked the turkey the same way, but brining made a definite improvement in the texture. 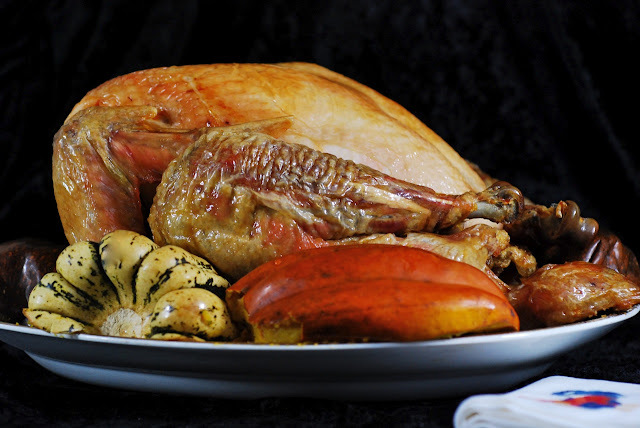 About a year ago, I read that turkey breast was perfectly done when the temperature was 150F at the thickest point. I knew that you could sous vide a chicken breast to 147F, so it followed that turkey would be done at around the same temperature. I tried it and was amazed at the results. I now use a Diagonal Split technique, which allows separate roasting of white meat and dark, and a convincingly reassembled turkey for the Thanksgiving table. The resulting tender, succulent white meat and moist, flaky dark meat makes this well worth the effort. 1. Start with a medium-sized turkey. You may brine it beforehand, but it is not necessary with this technique. 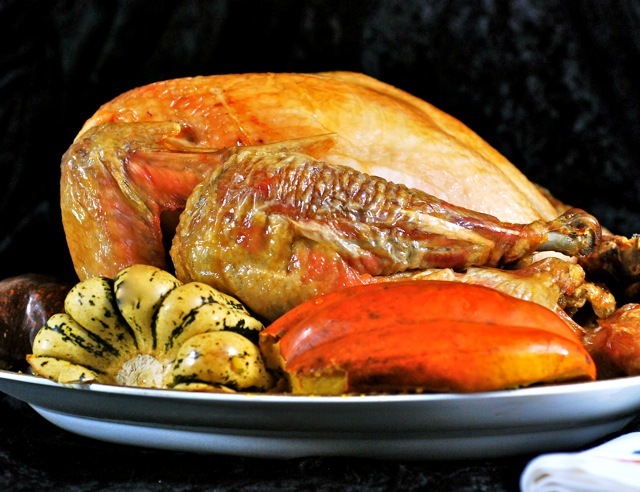 This turkey is a Vermont Free Range turkey from Misty Knoll. The quality of the bird is definitely reflected in the flavor. 2. 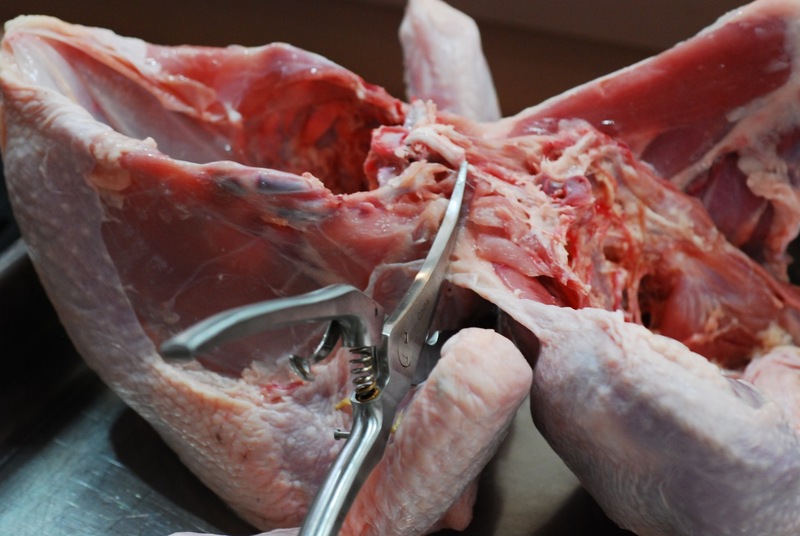 With a sharp knife, cut through the skin that separates the leg and breast. Note: it's great to have a well-made pair of shears. 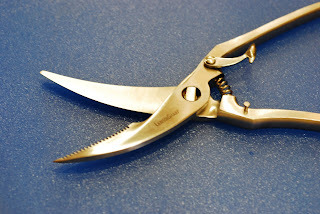 These stainless poultry shears from LamsonSharp in nearby Shelburne Falls do a beautiful job, and come apart for machine washing. 4. At this point, just bend the breast back, and it should separate from the leg section. 5. 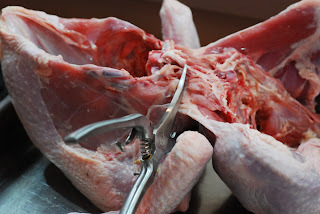 It takes only 3 snips with the poultry shears (no cutting through bone) and the legs separate from the breast. 6. Place the leg section in a roasting rack and truss to maintain shape. Roast just the legs at 375F to 400F for 1 hour 15 minutes (instruction is for a 12 lb. turkey. For a larger bird, extend this step for 15 minutes for every 4 lb. of total weight). 7. 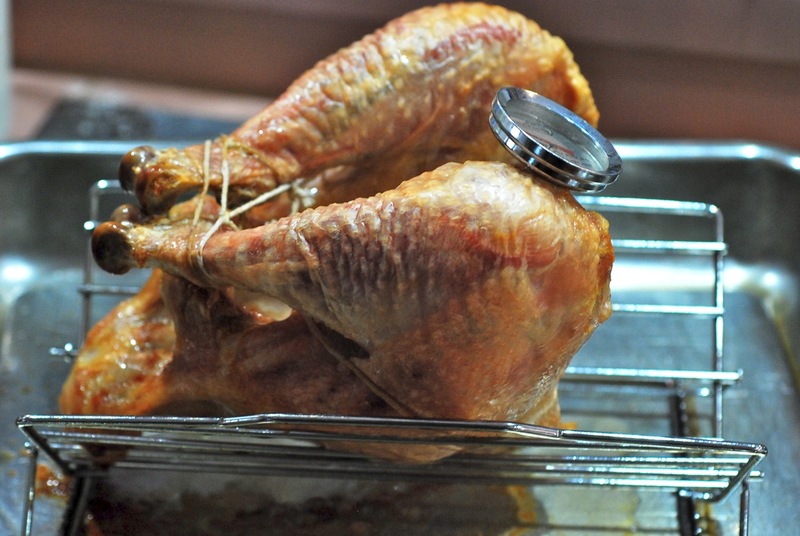 Turn the heat down to 325F (or 300F if you have lots of time or the turkey is small) . Place a second rack in the roasting pan, and position the breast half of the turkey, with a thermometer in the thickest part of the breast. 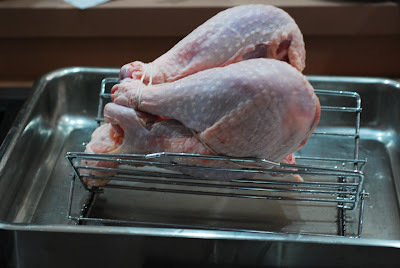 The legs will render quite a bit of fat; cover them with foil while the breast roasts. The goal is to continue roasting the legs very well, slowly, which produces a texture similar to duck confit. Check for doneness periodically. Juices on the legs should be clear, the skin should be translucent, and the meat should be very tender. They will probably be done before the breast, in which case remove them from the pan on their rack. Set aside until the breast is done. Baste the breast first with butter, then periodically with pan drippings. Roast until the breast temperature is 150F. Check this by moving the thermometer. If it goes down again, continue roasting until it reaches 150F. This is important, because 150F is perfectly done, 145F is underdone. The juices should be clear, not pink. NOTE: The only problem I had was getting the temperature probe into the thickest part of the breast. 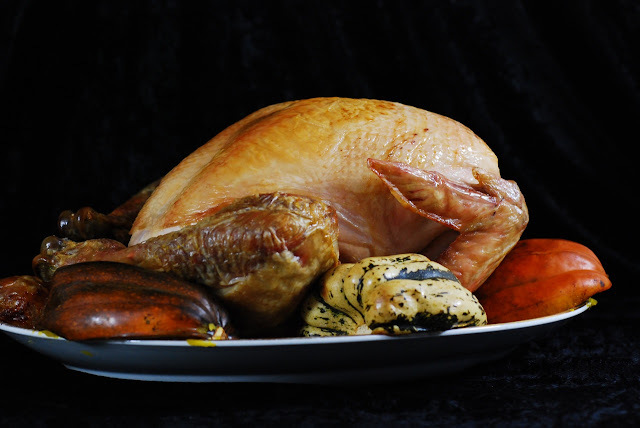 The temperature has to be consistent through the meat, and a turkey breast is an odd wedge-shaped slab, backed by bone at the thickest point. 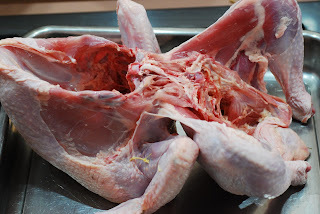 If the bone is very cold, it makes it more difficult for the thickest part to cook; so, place the thermometer in the thickest part of the meat, about 1/2" away from the breastbone. This is also why slow cooking is most effective for the breast; if cooked too quickly, the thinner edges will overcook. 8. 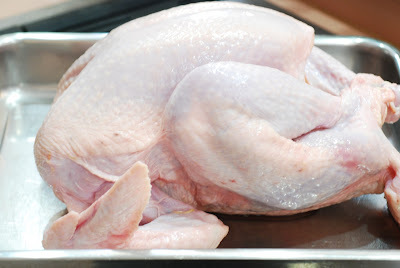 When you are sure the breast is uniformly at least 150F, remove from oven and let rest for at least 20 minutes. The temperature will continue to rise for several minutes after you remove it from the oven, which is fine. It may go up to nearly 160; that is fine. If you are not going to serve the turkey within the hour, you can put it in a warming oven at 150F. What a magnificent bird, and beautifully presented! This looks really intriguing. What happens if you make this without brining it first? Also do you need the shears? Can I do this with a very sharp knife? I want to try this this Thanksgiving. About how long total did it take for the legs to be done? And the breast part? Thanks! I've split the turkey by removing the backbone and then flattening the turkey. Place onto a cookie sheet, season with salt and pepper. Place chunks of butter under the skin. Roast in a 450F oven, basting with butter every 15 minutes for 1 1/2 hrs. (12 lb. turkey). 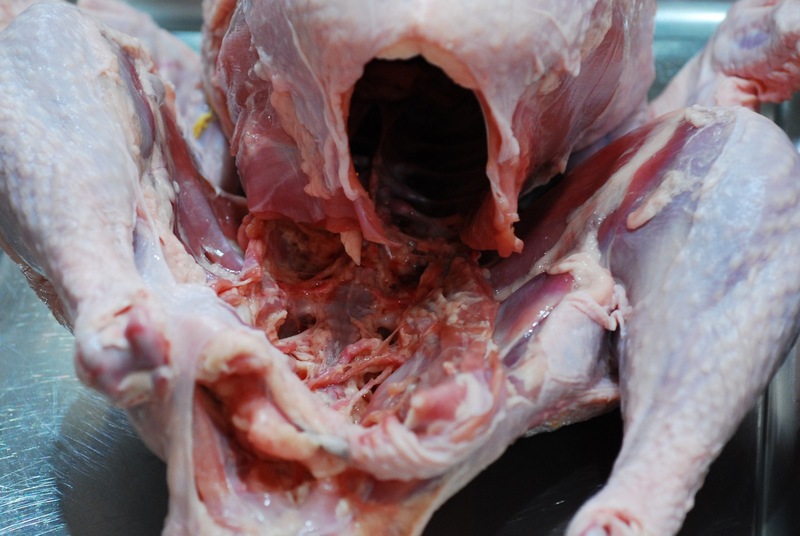 Insert the thermometer into the breast, looking for 160 degrees. Remove from oven and let sit for 20 minutes. 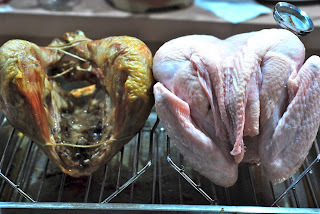 if use use a wire cooling rack for the breast rather than a roasting rack, would you have enough room to fill the cavity between cooling rack and bird with coarsely chopped vegetables/herbs/fruit/etc? it certainly looks like there would be enough room beneath the breast. 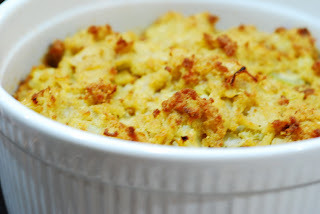 as for cooking the thighs, if the purposes is really to have a texture similar to duck confit, do you have any additional suggestions for a rub, or anything to tuck between the legs? i am doing a 'harvest season' get-together with my friends, as everyone has family obligations at the holidays. i plan on cooking our bird like this. thanks.